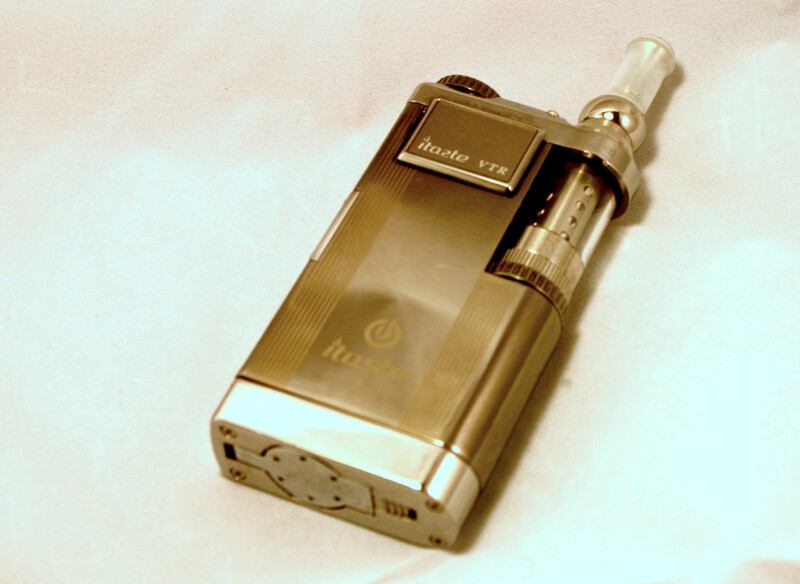 The Innokin iTaste VTR is the latest in a line of progressively more advanced and solidly designed advanced personal vaporizer (or APV or fancy e-cigarette or bludgeoning apparatus). Innokin’s newest device sports a very unique design and construction. It also comes with a new take on the famous iClear cartomizers with the new iClear 30S single coil model. Stick around for the iTaste VTR review and dive into Innokin’s newest offering. What is the Innokin iTaste VTR? I’m hesitant to call the VTR a box mod style device. Sure, it’s generally square, but in my mind, box mods tend to be more… simple. The MVP is more of a box mod, but the VTR is much more intricate and sculpted. An Innokin executive told me that what they’re trying to do with devices like this one and the 134 is create something that’s analogous to a Swiss watch. It’s the reason they went to dial controls and heavier materials on these devices. I have to say, I’ve always been a fan of Innokin’s engineering and build quality, but the VTR sets the bar even higher. The overall design is of course square, but with rounded corners pretty much everywhere. The side of the device that houses the clearomizer is more distinctly rounded. That portion of the device only goes halfway up the side of the device. The tank fits in that portion of the body and comes roughly even with the length of device with the drip tip protruding from the top. At the top of the VTR is a sort of loop through which the top of the tank protrudes. The final result is a tank which is fully integrated into the APV. The look is very finished. One concern I had when this product was announced was that only the iClear series of tanks would fit. As it turns out, many tanks fit easily into the area but not all. The ProTank and Vivi Nova style tanks fit, but SmokTech DCT tanks are slightly too wide to fit through the opening. If you do have a tank doesn’t fit, or an eGo-style clearomizer, an adapter comes with the kit that puts a SVD style top that sits above the top of the VTR. To be honest it seems to defeat the purpose of the design, so I essentially ignored it. Another interesting feature of the recessed tank area is a wheel. This lets you turn the wheel to further tighten the tank once it’s in place. A very nice touch. As interesting as the tank area is, there’s some other interesting features as well. Let’s continue our tour of the Innokin iTaste VTR. Starting from the bottom side, there’s a spring-loaded battery cover with a small slide switch that will open the battery door. Both the door and switch are flush mounted as to not interfere with standing up the device. The battery compartment houses an 18650 battery. One small annoyance with the design is that when closing the battery door, the switch doesn’t move in place on its own. It manually has to be moved to the side and then slid back into place. Along the side opposite the tank alcove is the power button (also slightly recessed). The button is also metal and is square in shape. Above the button is an LED with the traditional Innokin 3-color battery status LED display. Moving to the top you’ll find the adjustment control. This one isn’t like the 134‘s jog-wheel style control, though it is similar. Instead, there is a button on top of another wheel. To adjust the settings, press the button and you’ll see the currently installed tank’s resistance. After a second or two the current power setting is displayed. A simple turn of the wheel adjusts the power up or down. To switch from wattage to voltage mode, press the button again, then adjust using the wheel. Not quite as simple as the 134’s very analog settings, but it’s positively zen-like compared to other variable power devices on the market. Now, back to that screen. As I mentioned it’s an LED display with blue LEDs. It has the same mirrored screen iTastes have had since the first one. 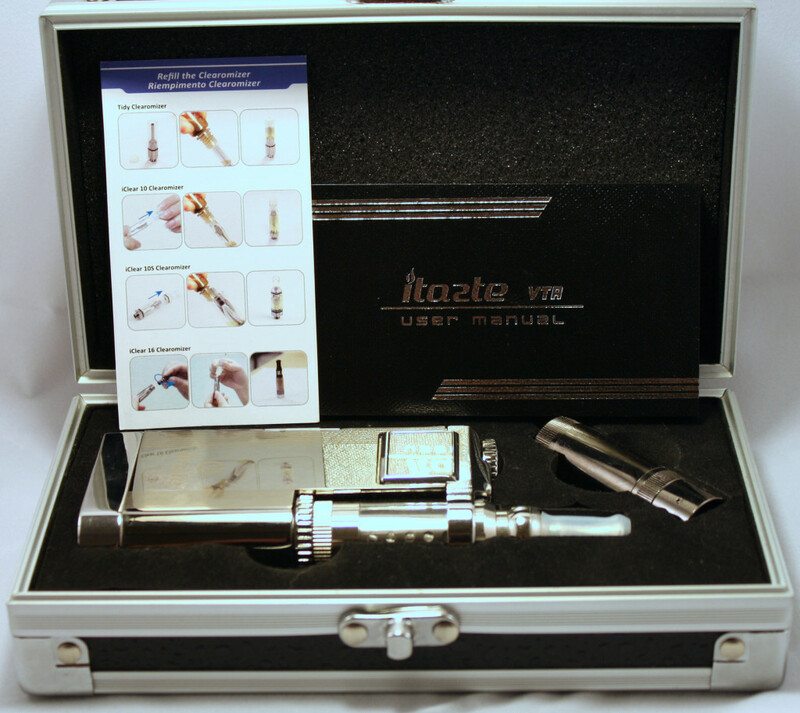 There’s a little chrome picture frame surrounding the display which also features an iTaste logo. To be honest, I think Innokin overdid it in the logo department. There’s the one on the mirror, below that on the bottom of the body is a larger iTaste logo (with the S facing the correct way). There’s also a slogan on the back. I think a more minimalistic approach would better serve this device. The other gripe I have about the display is that it’s still an LCD display. I really would like to see them move to something a little more high tech like a backlit OLED display. Since the display isn’t on all that much, it’s not a huge deal, but it would be a nice finishing touch. Save for the slogan I was griping about earlier, there’s not much going on the back of the VTR. There are some etched strips which remind me of Eddie Van Halen’s guitar from back in the day, but that’s about it. Of course it’s not the various parts that make the VTR so interesting, it’s the overall package. Everything just feels so integrated with it. The construction is absolutely solid. Of course building something that rugged out of metal makes for a heavy device. I think an undocumented feature of this thing is that you can use it to crush walnuts.